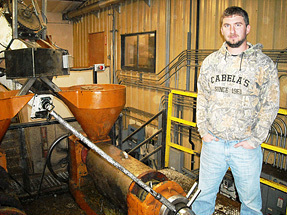 Jake Madison with the Canola crusher. The Madison family is nearing the “Century Farm” milestone having farmed their land since 1914. But they’re not stuck in the past. They use forward-looking farming methods that conserve natural resources and have even patented an environmentally responsible valve for recharging aquifers. Kent, who is a third generation Madison, operates the family farm with his sons Jake and Aaron. Most of the property is irrigated cropland where they raise potatoes, wheat, corn, canola and alfalfa, though they occasionally dabble in vegetables and popcorn. They lease land to local farmers growing peas, beans, rye grass, and bluegrass, and Beef Northwest grazes its cattle on the property’s non-farmable acres. 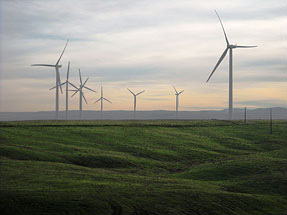 Part of Madison Farms' wind energy project. 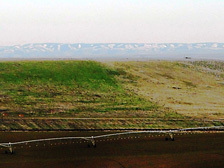 Madison Farms also houses 50% of the first farmer-owned wind turbines in Umatilla County and the first agricultural aquifer storage recovery (ASR) well in the world. Kent Madison’s ingenuity can be seen in many areas of the farm operation, from saving winter flood water for use in the summer to exploring methods for making their canola food grade and/or recyclable as biodiesel. The left side of the field has been spread with bio-solids while the right side has not.